NEW YORK McDonald's (MCD) next week will add a permanent offering to its menu: the chicken McWrap. The Oak Brook, Ill.-based chain says the McWraps use the same type of flour tortillas and chicken as its snack wraps, which were introduced in 2006. 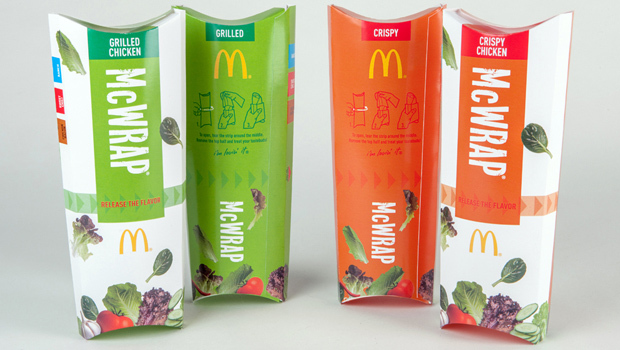 But two of the new McWraps will come with cucumbers, which the company says will mark the first time the vegetable will be part of its core menu. The wraps range from 360 to 600 calories, depending on whether people pick grilled or deep-fried chicken. McDonald's has been stepping up the pace of its new menu offerings as it struggles to grow sales in the challenging economy. Last year, the company ousted the head of its U.S. division after a monthly sales figure fell for the first time in nearly a decade. By refreshing its menu, McDonald's is hoping to hold onto customers as it faces a shifting industry and intensifying competition from the likes of Burger King and Wendy's. Next week, for instance, The Wendy's Co. plans to roll out its "Flatbread Grilled Chicken Sandwiches" in two varieties; an Asiago Ranch flavor will have 530 calories and the Honey Mustard flavor will have 370 calories. The latest offerings also reflect the changing tastes of diners, who are increasingly looking for more premium ingredients with a healthier image - even at fast-food chains. McDonald's, for example, is officially calling the new wraps "Premium McWraps." It also plans to offer a version of its Egg McMuffin made with egg whites starting April 22. And this week, Burger King Worldwide Inc. rolled out its first turkey burger following the success of turkey burgers at Carl's Jr. and Hardee's. Dan Coudreaut, director of culinary innovation of McDonald's, says the wraps will be a new "platform" and that different varieties are already in the pipeline. These could include spicy or Cajun flavors, he said. In Europe, he noted, there is a shrimp McWrap. Although the chicken McWraps officially launch nationwide next week, the company says many restaurants already have them. The suggested price for a wrap is $3.99.